Warehouse shelving and racking make up the skeleton of your warehouse, and leaving a damaged rack unrepaired can be just as dangerous to your operations and your employees as walking around with a broken bone. Warehouse shelving, including pallet racks, cantilever racks, mezzanines, and a wide array of other storage and shelving systems, can easily be damaged by everyday warehouse activity. Forklift collisions, falling product, or other damage due to human error or equipment malfunction can all threaten the safety and efficiency of your warehouse environment. Luckily, The Performance People offer fast and effective warehouse shelving repair when you need it. On-site repair: Our certified rack repair personnel will make a site visit to repair the damaged warehouse racking. Minimal downtime: In most cases, our experienced service technicians can repair the damaged rack in place, without requiring that the product stored on other levels of the rack be removed or relocated. 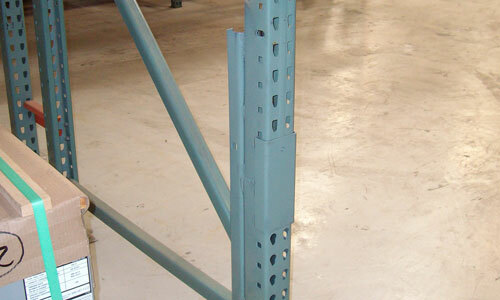 Rack reinforcement and improved strength: When we repair a storage or pallet rack, we remove, replace, and reinforce the damaged section, not only saving you the money of having to replace an entire storage rack due to one area of impact, but leaving your warehouse shelving system stronger than it was to begin with. When you call Naumann/Hobbs to fix your warehouse shelving, you can return to normal warehouse activity within hours, and you’ll be even more protected against future damage. Standard warehouse shelving repair is offered Monday through Friday, 7 a.m.-4 p.m. At an additional price, weekend or after-hours installations and repairs can be scheduled outside of normal work hours. Learn more about additional Warehouse Safety services with Naumann/Hobbs, or call us at 866-266-2244 for rack repair services or more information.